Visited Mongolia during the first and second week in April, Ulaanbaatar has limited number of International flights mostly from China, Seoul, Hong Kong and not too sure but limited flights from Germany. I flew MIAT (Mongolian Airlines) from Hong Kong, Immigration is quick and easy, no visa needed for US passport holders. Once outside Chinggis Khaan International Airport in Ulaanbaatar, there was snow on the ground. April is still cold in Mongolia. Airport to City, Taxi cost was USD $ 12. My Hostel arranged for a airport pickup. Stay - I stayed at Zaya Hostel USD $12 a night for a private room with shared bath. Breakfast Included. 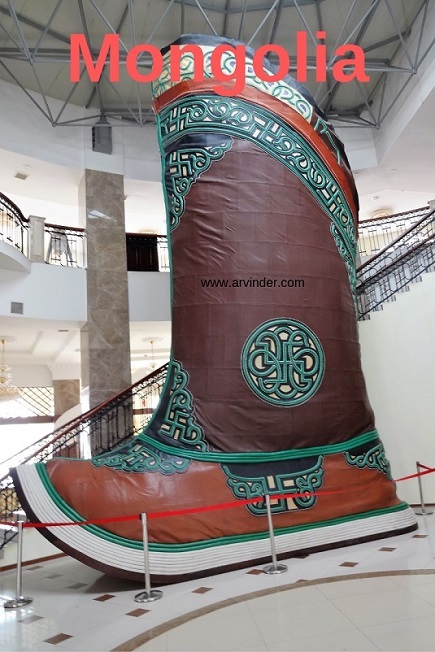 Picture to the right - Traditional Mongolian boot, largest shoe in the world, in Genghis Khan Theme Park, Chinggis Khan Statue Complex. In Tsonjin Boldog, about an hours drive from Ulaanbaatar. Ulaanbaatar is surrounded by hills, the landscape outside the city is just beautiful. The City itself is just another big city, with rush hour traffic problems. Most people in Ulaanbaatar live in Apartments. Currency - For hotels and Tour companies you can pay in USD or use Visa Mastercard, However do keep some Mongolian Tughrik or MNT. For example I bought soup in Gorkhi-Terelj National Park and ate in a Yurt, where no one spoke English and was glad to have local currency. Now I was there in April, it is cold and not a tourist season. So Gobi desert was out, if you are there in summer, there are good things to be heard about gobi desert tours. 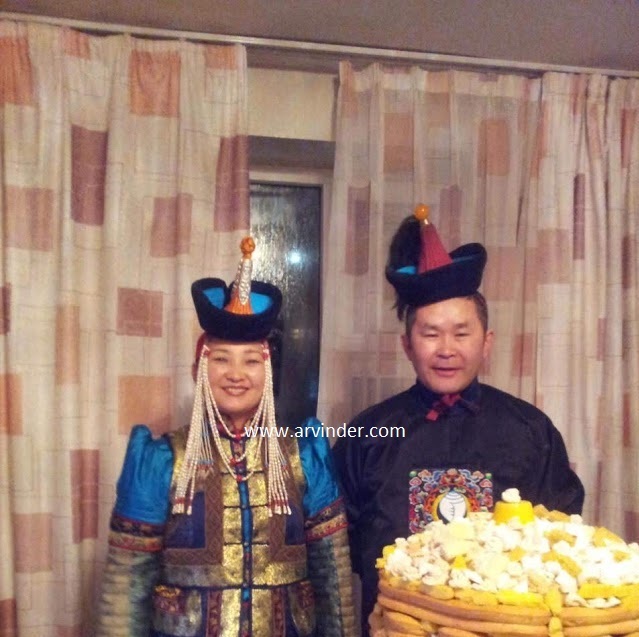 TIP: If you have time, book your tours while in Mongolia, online prices are just too expensive. One would imagine on-line prices to be cheaper, its quite the opposite. 1) Chinggis Khan Statue Complex - Largest equestrian statue in the world at the time of writing this post. 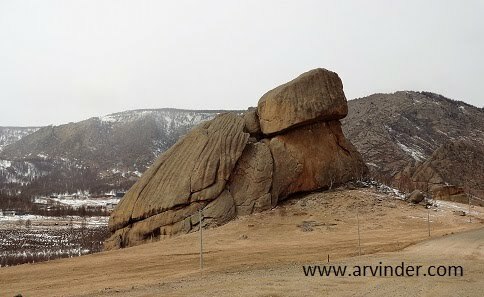 I took a tour which included Chinggis Khan Statue Complex, Turtle Rock in Gorkhi-Terelj National Park, Ariyabal Meditation Buddhist Temple, Lunch in a Ger or Yurt as it is called in English, drive around UB. The cost was $100 USD. From UB, its about 45 minutes drive to Chinggis Khan Statue Complex, its Chinggis and not Genghis as per my Mongolian guide. There is an entrance fee of 30,000 Mongolian Tughrik or around 22 USD, there is a display of rural Mongolian life, history of the Khan's and a stairway to the top of the horse. Spent an hour there, that's enough time and was off to see turtle rock. 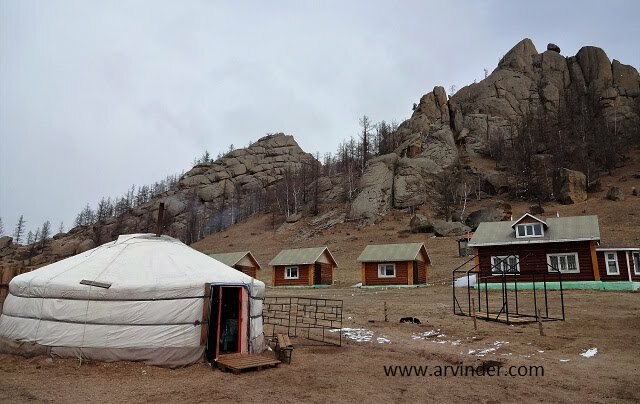 About a 15 minute ride from Chinggis Khan Statue Complex, the best of the trip was a lunch in a yurt with Mongolian folks. they cooked me fried bread with stuffing, and didn't want any money from me, I left a tip. My Last stop before heading back to UB, from the entrance to the meditation center there is mile and half to 2 mile hike upto the Buddhist Temple, I was out of breath by the time I reached the top. One can do free camping and meditation in the summer there. There is also a bunk hall if you don't want to camp. There is Tibetan Buddhist Mantra 'Om Mani Padme Hum' painted in nearby Hills. View of the hills from the Monastery, pretty amazing! The square is surrounded by hotels, opera, stock exchange, government buildings. The Gandantegchinlen Monastery is another must see. Clean Air - To and From the Airport, both the cars were electric, so was the van that took me Gorkhi-Terelj National Park. Ulaanbaatar being one of the coldest capitals in the world, there is lot of coal burning in the winter, the government there is changing that for cleaner means of heating. Ulaanbaatar is also home to Naadam Festival held in July, they include Archery, Horseback riding and wrestling competitions. Leave me some Comments, Thanks!! Excellent information and great pictures! I am already beginning the first stage of planning my trip. Thanks!